Like most suburban families with kids, the Tymesons run a hectic schedule. School classes and homework are top priority, several kinds of sports and time with friends add to the mix. Also, Chris Tymeson, the father of Gage and Taylor, often works an hour from their suburban Kansas City home. From a divorced home, his kids spend part of their time with their mother. Yet Gage, 10, and Taylor, 6, have already caught more fish this year than many adults will by the end of the summer. That’s because they go often to some good fishing holes. 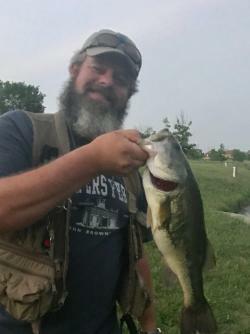 Tymeson’s state fishing license is all that’s required. His kids fish for free. This year the program has about 50 community lakes or ponds enrolled. Many are in large cities. The four the Tymeson’s fish are within a metropolitan area of over two million people. But the Tymesons always have plenty of casting room. Often, they’re the only ones fishing the public water on a particular evening. Most times, they do well. They fish pieces of nightcrawlers below bobbers so the kids won’t have to be continually casting, and also because it catches fish. Bluegill and green sunfish are their most common catches. The kids have also caught some nice channel cat. Wildlife and Parks stocks some of the CFAP waters. 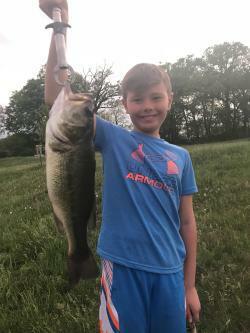 Gage has this year’s record largemouth bass, a fish of 19 inches. 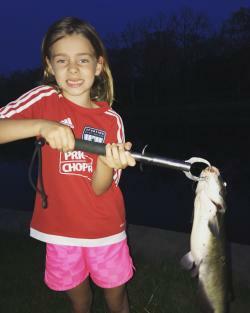 Taylor, the family’s most enthusiastic angler, has the clan’s biggest channel cat of the year. Their father is fine fishing in third place on the family angling trips. Mainly he’s just thrilled to have great opportunities for family time outdoors, so very close to their suburban home.